Enormous Aquifer Discovered Under Greenland Ice Sheet | Watts Up With That? The water in the aquifer has the potential to raise global sea level by 0.016 inches (0.4 mm). That’s assuming it can get out sometime in the distant future. Greenland’s topography under the ice is bowl shaped. Buried underneath compacted snow and ice in Greenland lies a large liquid water reservoir that has now been mapped by researchers using data from NASA’s Operation IceBridge airborne campaign. A team of glaciologists serendipitously found the aquifer while drilling in southeast Greenland in 2011 to study snow accumulation. Two of their ice cores were dripping water when the scientists lifted them to the surface, despite air temperatures of minus 4 F (minus 20 C). The researchers later used NASA’s Operation Icebridge radar data to confine the limits of the water reservoir, which spreads over 27,000 square miles (69,930 square km) – an area larger than the state of West Virginia. The water in the aquifer has the potential to raise global sea level by 0.016 inches (0.4 mm). The new research is being presented in two papers: one led by University of Utah’s Rick Forster that was published on Dec. 22 in the journal Nature Geoscience and one led by NASA’s Lora Koenig that has been accepted for publication in the journal Geophysical Research Letters. The findings will significantly advance the understanding of how melt water flows through the ice sheet and contributes to sea level rise. When a team led by Forster accidentally drilled into water in 2011, they weren’t able to continue studying the aquifer because their tools were not suited to work in an aquatic environment. Afterward, Forster’s team determined the extent of the aquifer by studying radar data from Operation IceBridge together with ground-based radar data. The top of the water layer clearly showed in the radar data as a return signal brighter than the ice layers. Koenig, a glaciologist with NASA’s Goddard Space Flight Center in Greenbelt, Md., co-led another expedition to southeast Greenland with Forster in April 2013 specifically designed to study the physical characteristics of the newly discovered water reservoir. Koenig’s team extracted two cores of firn (aged snow) that were saturated with water. They used a water-resistant thermoelectric drill to study the density of the ice and lowered strings packed with temperature sensors down the holes, and found that the temperature of the aquifer hovers around 32 F (zero C), warmer than they had expected it to be. – And the error margin is …? How much does sea level varies around the world on daily basis, due to the moon? Has the aquifer always been there? Could the melt have been caused by volcanic / geothermal activity? Hmmmm. Isn’t it a bit nippy above lake Vostok. I vaguely recall a recent item about record cold in East Antarctica. I also vaguely recall extreme snow in East Antarctic too. Ah, so the sea level rise is hiding in the deep of Greenland. I knew it. Would it be easier to get to this aquifer or the Moon? The glacial ice on Greenland has a temperature of about -31C down to about 1500 metres so this water is not going anywhere. It is just flowing some distance until it refreezes. The glacial ice starts to warm up below 1500 metres due to bedrock heating until it gets to -2.7C to -3.5C at bedrock which is just enough to melt the ice at the bottom given the higher pressures. So the water is not going to flow for a 1000 kms to the coast through -31C ice or make it to the bottom 3 kms lower trough -31C ice at higher and higher pressure. Does everything NASA publishes have to have a reference to global warming ? Why are we wasting time and money on a settled science? Okay, okay. I understand. 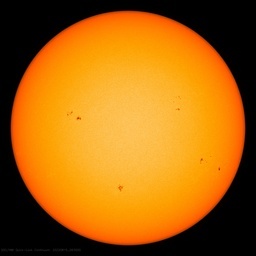 This is a sign of man made global warming but without more research we won’t be able to blame the usual suspects. The serious questions are so obvious. Drain the lake and the rebound is? How long would it take? The one obvious assumption that needs to be addressed: “Altogether, this makes the ice in the vicinity of the aquifer warmer, and warmer ice flows faster toward the sea.” It’s a lake of slush in a bowl. Who is to say the system prevents glacial ice from advancing? SasjaL these are climate scientists and therefore above such mundane things like measurement and estimation uncertainties. I get the impression that researchers are desperate at this point. The line which puzzled me is the reference to permanent meltwater. Is it possible for meltwater to be permanent ? Isn’t that just called water? Please insert the word “getting” between “are” and “desperate”. Thank you. Maybe this is where all the “missing heat” has gone. If “water flows through the ice sheet,” does that mean that CO2 is not permanently trapped in contemporary ice and that measurement of CO2 content in ice cores does not represent the CO2 levels in the atmosphere from indicated time of the ice formation? ” The newly discovered hotspot, an area where Earth’s crust is thinner, allowing hot magma from Earth’s mantle to come closer to the surface, is just below the ice sheet and could have caused it to form, von Frese and his team suggest. Ok, I am just a Petroleum Engineer but having lived in North Dakota, Alaska, and Wyoming for many winters even I knew that water in the liquid state exists under ice, so why is this obviously over- grant- monied id-ten-t surprised that there is water under ice??? The moran must live in the tropics year round and the only ice he sees is in a margarita. Good thing I live on a hill here in central Texas, man can you imagine what “0.016 inches/0.4 mm” of water would do to my insurance in the flood plain. Guess I need to put my house on stilts. Why, we have had 28 inches of rain the last 3 months and so far except for the poor souls in the creek bottoms nobody has headed for the mountains. That is geothermal energy melting that ice. That water isn’t going anywhere. “Researchers estimate Greenland has lost more than 200 million tons of ice and snow each year since 2003. The ice sheet will completely disappear when the planet’s average temperature rises by 2 to 7.2 degrees Fahrenheit (1 to 4 degrees Celsius) above preindustrial temperatures, as predicted by the latest report from the Intergovernmental Panel on Climate Change, released in September. Earth’s surface temperatures are already up 1.3 F (0.7 C) from preindustrial temperatures, with average temperatures rising faster in Greenland. “This doesn’t change our knowledge that too much carbon dioxide in the air will melt Greenland’s ice, but it will help us make better estimates of how much and how fast,” Alley said. sorry about the link, it did not work as planned. It was supposed to go to the Morans meme pic. If the mod will delete the link and this I would appreciate it. No way to preview a post. Mea culpa. And this aquifer was not there before? It appears to me that ice fishermen rely on the fact that there is water under the ice in lakes. I’m not sure why anyone would be ‘surprised’ that water survives under the Greenland ice sheet when it survives under the East Antarctic Ice sheet. Last I heard the temps in East Antarctica are a good bit colder than those in Greenland. “An ice core segment extracted from the aquifer by Koenig’s team, with trapped water collecting at the lower left of the core. WOW! … “Who knew that there’s water trapped in ice? Who knew that when you core into ice in a lake that the hole fills with water. Ever notice how your ice cubes jump out of the glass faster when the water is warmer? Man oh man how would we be able to handle a 0.4 mm ocean level increase, run run run. “And if the trapped water were to refreeze, it would release latent heat” ya look out, ever notice how much warmer it gets when water freezes, just like the excessively warm ice ages All that latent heat escaping … wait … Huh? …what …? The NASA , NOAA, USGS and other gov websites estimate that 80,000 cubic miles of ocean water evaporates each year. This equals 4.6 billion tons of water per second. Global ocean water evaporation for 33 seconds equals the 154 billion tons of water under the Greenland ice sheet. It seems like enormous means different things to different people. Listening to Radio overnight in Australia, On a commercial network in the late evening they reported the aquifer could lift sea levels 0.4 mm. Switched to our ABC at midnight where the reported the volume of water trapped in the aquifer would lift sea levels just under half a metre, I kid you not. They just like to use gynormous terms, the better to scare the ignorant. Two of their ice cores were dripping water when the scientists lifted them to the surface, despite air temperatures of minus 4 F (minus 20 C). Pardon my utter stupidity but WTF does this have to do with global warming? Since they discovered the aquifer is it just possible they might discover something else??? I say keep looking. The science is not settled, the debate is not over, not by a long shot. Ice sheets in Greenland and Antarctica are based on continental rock and are coupled strongly to changes in global sea level. Their beds may be frozen or thawed, but it has not been known how much or where basal melt occurs, except in special cases where a borehole has reached the bed or where airborne radar has revealed subglacial lakes and reflective ice stream beds in Antarctica. We have used a previously published technique to detect subglacial melt water in the general case and have here applied it to radar-sounder data collected over northern and central Greenland. We have found extensive subglacial water along between 13% and 20% of the flight paths. This paper provides maps of the measured locations and probable extent of subglacial water. And on the fringes we have non-volcanic ‘hot tubs’. HEAD FOR THE HILLS!!!!! Even if it all came out now along with current rates I think we can survive 7mm in one year! But it’s in a bowl. This paper has absolutely nothing to do with man-made gaseous global warming. Nothing. Maybe soot. I know, it has been obvious for many years now. The numbers of mathematical and statistical errors they produce, would have got anyone throwed out of tech/science (post mandatory) school during the 1980’s here in Sweden … Many so called “proofs” also contradicts things tought in the last three years in mandatory school here back then. Quality of school here has decreased since beginning of the 1970’s, due to the socialists (in some places comfused with liberals). A team of glaciologists serendipitously found that ice floats on water, even on Greenland reservoirs. Water storage in firn is a topic that has been researched by scientists for more that 60 years! Sharp, R.P., “Meltwater behavior on upper Seward Glacier, St. Elias Mountains, Canada,” International Association for Scientific Hydrology Publication 32, General Assembly of Brussels 1951, pp. 246-253, 1951. The firn is on top, not the bottom! And the study, mostly, is on the southeastern ablation zone between elevations of 1000 m to 1500 m with the depth of firn (radar signature) as much as 20 m in places near one of drill sites. To be firn, snow has to survive (and metamorphose) for at least 2 years. These scientists could learn a lesson from the old time Alaskan Highway truck drivers. On what was barely a two lane wide dirt highway these tractor trailer rigs would hit up to 70 mph during the dry summer months. Neophytes to the highway would reportedly panic when they encountered one at that speed; oncoming and at the crest of a hill. Perhaps the truck drivers drove that fast because, before it was paved, a sudden rainstorm could shut the highway down for two weeks. And that was probably the reason most of the old time truck drivers reportedly preferred the highway during the winter even though temperatures as cold as -60 F or more could be encountered. The road froze over and at temperatures of about -30 F to -40 (Centigrade or Fahrenheit – take your pick) it was as good as driving on pavement. What makes an ice covered road treacherous is the thin film of liquid water on top that can’t permeate the ice. That water can exist in a liquid state down to -30 to -40 F. Below that it can’t and then the ice provides as much traction as asphalt. Our publicly funded scientists could learn a thing a two about the temperatures water really freezes at from the Alaskan Highway truckers. Or, they could learn it from the tire manufacturers who design winter snow tires with special compounds and micro siped treads to evacuate that thin film of water. Heck, they could learn it from a good bartender who still goes ahead and shakes a freezer chilled gin over cracked ice to get some of that water in the martini. But, then again, the bartender, tire designer, and truck driver depend on knowing how the world really works. Or they don’t get paid. Ermm…where does the water in the snow that falls over Greenland come from? Grant applications soon to follow. Another spot the pipeline could go is southern California…. I believe in this case the correct units would be ‘in Olympic-sized swimming pools’. Yes, because that’s what rocket science is all about. 0.4mm? Jeeze, Vince can mop that up with a Sham Wow. in a few seconds! Are there any critters swimming around in that water – like one-celled or more? I’m sorry, but that sort of statement by the project scientist who is studying a major ice cap is a profound display of utter ignorance about the subject he is working on and a display of complete incompetence by any glaciologists he is working with. The presence of sub-glacial lakes had been first theorized over 100 years ago, and was confirmed, first by radio-echo sounding data in the 1970’s, and later, by drilling into Lake Vostok in 2012. To date over 400 such lakes have been identified under the Antarctic Ice cap. The fact that at greater pressures, the freezing point of water can be suppressed below 0 Celcius, coupled with ice being a very good insulator, meaning that the deeper you go into a glacier (or ice cap), the closer the temperature of the ice can be to 0 Celcius, means that inevitably you will find supercooled liquid water – especially as you get closer to the earth’s crust where the internal heat of the earth will transfer directly to the water. Even at $0.50/m3, that 154 billion tons is worth $77 billion. Might be worth tapping mining and shipping it to where it is needed. Will scientists ever look at Greenland again without fear of melting ice and rising seas? How much did I pay for this? Cynically speaking, would it be fair to say, some actual science has been done here? To cover this mistake, as careers must be at stake, all the obligatory waffle of sea rise and global warming has been thrown in, to cover some rather interesting news. However water under ice, is not unexpected by anyone with experience near either pole. Most of the very small furry creatures in Canada, live under the snow, gaining a thermal advantage which lets them survive our winters. Wave heights in open ocean can reach over 100′ Winds can whip the surface of the ocean into a froth, blurring the line between air and water. The surface of the oceans are in constant motion and different parts are moving in different directions. A sane estimate of global sea level would include error bars of at least +/- 100 feet. David Oliver Smith and bobl – that was my first thought too: that it made a mockery of ice core data. 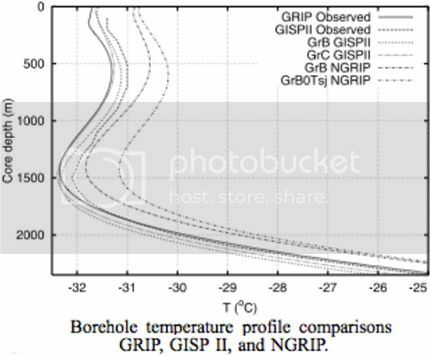 Actually, although I’m very sceptical of ice core data, I am not sure that it really is that hopelessly bad, and I suspect that this particular paper is the more wrong, ie, it is even less reliable than ice core data. In order for the water to freeze and release all that energy it will have had to thaw and absorb that same energy. Net zero, game over. It’s about time someone made the point about the topography of Greenland. The weight of the ice is so great that the surface of the land has been depressed in the shape of a bowl. 1) If it freezes and then is squeezed out by the pressure of the ice above. 2) if ii is displaced by ice from above and forced out through lateral cracks in the ice. So they should look for lateral cracks or channels in the ice. But first check with the people in Antarctica who have already reported such channels. This find does not strike me as a bid deal. That or a reference of outreach to the muslim world, per Obama’s mission statement for NASA. Any time you put pressure on ice it liquifies, that why skates and curling rocks work. Tires only have traction if they don’t spin or slide, and under a normally rolling tire the the rubber is instantaneously not moving. Once the tire spins or slides its riding on a layer of water on ice. I think you’re all missing the point. This discovery has opened up huge vistas of untapped grant money; hence the excitement. Under which scenario would that ever happen? If you look at the related article on the (notoriously warmist) BBC website (http://www.bbc.co.uk/news/science-environment-25463647) you’ll find it says “They believe that it holds roughly 140 billion tonnes of water, which is the equivalent to 0.4mm of sea level rise PER YEAR” [my emphasis]. Hardly world-shaking news since much of the Greenland ice-sheet is warm-based, i. e. there is a water film beneath the ice. It’s pretty hard to see how a warm-based ice-sheet could not have an aquifer beneath it. Most likely cold-based ice sheets have aquifers underneath too, but they would be sealed beneath a layer of permafrost. As for where the water will go, almost all aquifers ultimately drain to the ocean provided the top of the aquifer is higher than the current sea level. Gravity and all that you know. The rate depends on the hydrostatic head of the water and the permeability of the ground/rock. It must be the new measure unit for volumes. Astronomers identified a planet, 15 light years away, which could raise sea levels by 1000 km. It has a few satellites, the smallest of which could raise sea levels by 100 m, drowning most major cities of the world. So, we go from “the Sun plays no role in our global climate” to now “ice may be wet”? Are these scientists really this dumb? Don’t we already know that there is water under ice? Especially if that ice sits in a bowl? What next? darker sides of earth tend to be cooler than those that are sun-lit? The moon plays no role in global climate change? A very embarrassing paper filled with lies and feeble notions of pseudoscience “conclusions” galore. Water storage in firn is a known topic and studied to death for decades (10). Water in firn is NOT a “new facies”, only and idiot would write that and I know the idiot first hand who pined it. “Project” Ice-Bridge is indeed in dire straights pushing such a ludicrous paper and paying off Nature Geoscience reviewers and Editor. How else could a travesty as this be “published” in other than a supermarket Tabloid … Oh …. this is Nature “Non”Geoscience. Ha Ha. An aquifer was discovered below the soil surface of Greenland? And they are shocked by that? Surprised? Turned upside down? Sounds like a guy who doesn’t know where milk, eggs, and steak come from. They found the missing heat! It’s at the bottom of Greenland. The referenced article suggests that sea level rise would be buffered because melt water would have to fill the pores in the firn prior to being able to runoff into the ocean. But I guess if you can magically move all this water at once it could magically rise sea-level in that magic world. So science fail. True scientists are trying to think up a way of exploring the Vostok reservoir (which they surely already knew about) without contamination. So far they admit they don’t know how. Subglacial lakes are well known. A century and a half ago the Tete Rousse glacier ruptured and spewed its liquid underground lake onto St Gervais, France. 200 or so dead. And many other historical examples. This seems a case of children being left alone in the lab / munitions factory. Maybe we can put Algore to work siphoning all that water out of there and spitting it into the ocean? That’s more productive than what he’s been doing for years. I looked at the aquifer(s) and the adjacent seabed alluvial formation and it seems possible that this aquifer could discharge in a non-stochastic manner… This could matter as it may impact the Northern Atlantic Conveyor Current. A sudden and significant discharge of freshwater could trigger events like the Younger Dryas. By dating the water in the aquifer, there could be relationships inferred for these type of minor events and / or ice ages.